If you look frequently at satellite imagery or astronaut photography, you have probably noticed bright patches of light that can make certain bodies of water gleam with unusual color. (If not, look at these examples in the waters around Cape Cod and the Lesser Antilles, as well as rivers in Brazil.) That gleam is caused by sunglint, an optical phenomenon that occurs when sunlight reflects off the surface of water at the same angle that a satellite sensor views it. The result is a mirror-like specular reflection of sunlight off the water and back at the satellite sensor or astronaut. If bodies of water were perfectly smooth, a sequence of nearly perfect reflections of the Sun would appear in a line along the track of the satellite’s orbit. In reality, water surfaces are irregular and often in motion due to waves and currents, so the sunlight gets scattered in many directions and leaves blurry streaks of light in the swaths of satellite data. For instance, notice the strips of sunglint in the mosaic below. All of the data was collected by the Moderate Resolution Imaging Spectroradiometer (MODIS) on NASA’s Aqua satellite on July 3, 2014. 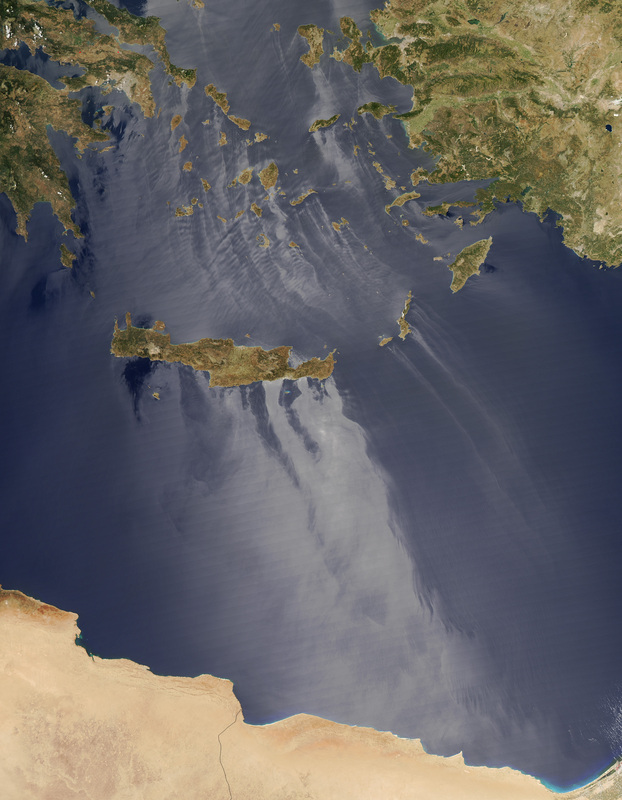 The combination of sunglint, wind patterns, and island shapes around Crete and the Aegean islands made for a particularly spectacular scene that day. (See the image at the top of this page.) Although sunglint washes out many features, it also reveals details about the water and atmospheric circulation that are usually hidden. 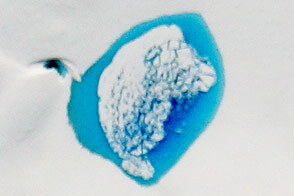 In this case, sunglint exposed wakes caused by north and northwest winds that roughened and smoothed the water surface behind Crete and the other islands. 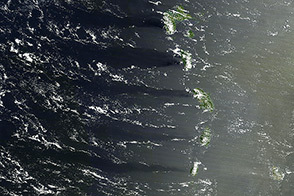 The islands create a sort of wind shadow—blocking, slowing, and redirecting air flow. That wind, or lack of it, piles up waves and choppy water in some places and calms the water surface in others, changing how light is reflected. 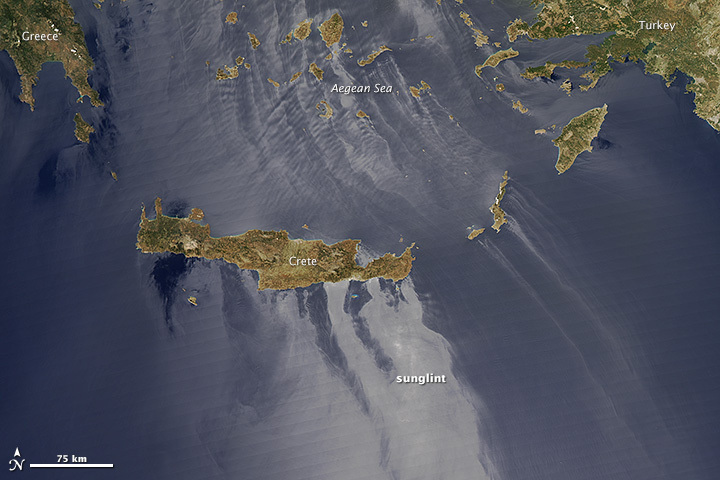 In addition, sunglint revealed what appear to be atmospheric gravity waves downwind of many of the Aegean Islands. 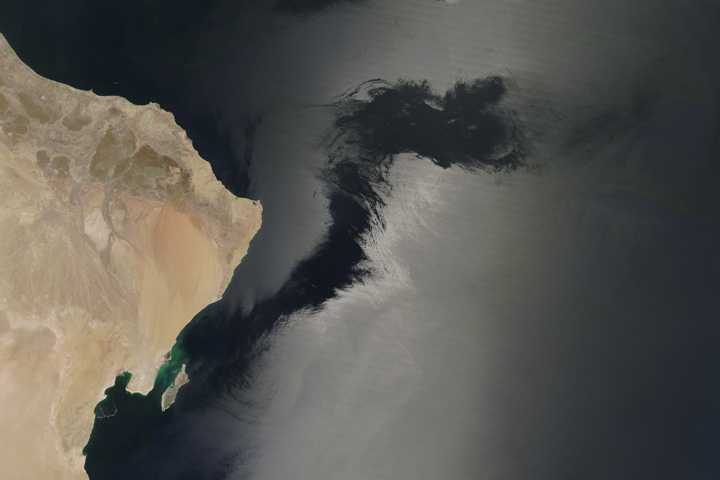 While sunglint often produces visually-stunning images, the phenomenon can create problems for remote sensing scientists because it obscures features that are usually visible. This is particularly true for oceanographers who use satellites to study phytoplankton and ocean color. As a result, researchers have developed several methods to screen sunglint-contaminated imagery out of data archives. Despite the challenges posed by sunglint, the phenomenon does offer some unique scientific opportunities. It makes it easier, for instance, to detect oil on the water surface, whether it is from natural oil seeps or human-caused oil spills. This is because a layer of oil smooths water surfaces. 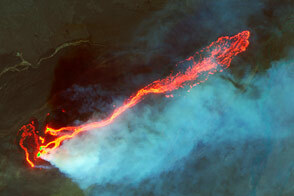 NASA images courtesy LANCE/EOSDIS MODIS Rapid Response Team, GSFC. Caption by Adam Voiland. 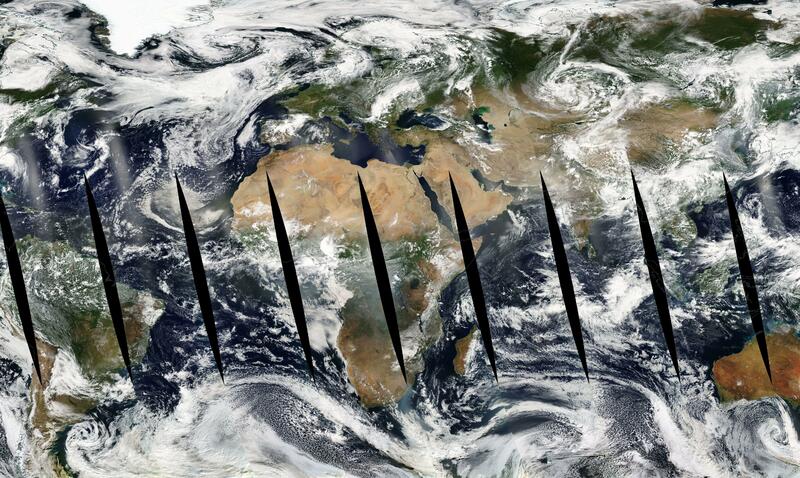 In addition to posing scientific challenges and opportunities, sunglint makes for some spectacular satellite images. Adamo, M. (2009, February 17) Detection and tracking of oil slicks on sun-glittered visible and near infrared satellite imagery. Remote Sensing 30 (24), 6403-6427. Kay, S. (2009, August 4) Sun Glint Correction of High and Low Spatial Resolution Images of Aquatic Scenes: a Review of Methods for Visible and Near-Infrared Wavelengths. Remote Sensing. 1 (4), 697-730. NASA Earth Observatory (2013, February 25) Northeastern USA Coastline in Sunglint. 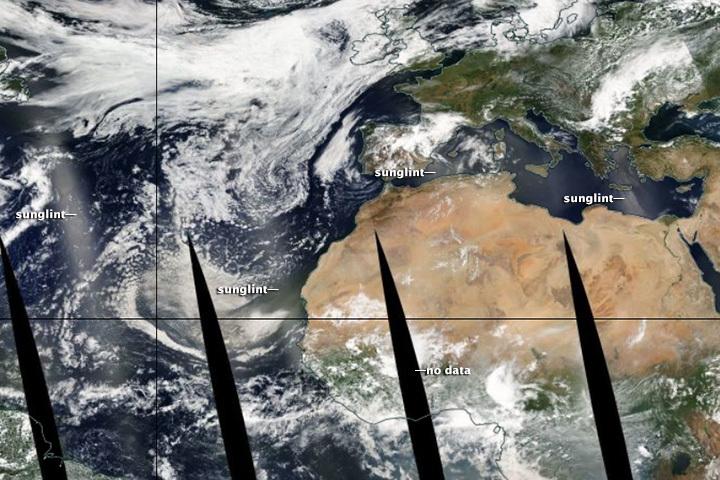 NASA Earth Observatory (2013, June 20) Trailing the Canaries. NASA Earth Observatory (2010, July) Oil Slick in the Gulf of Mexico. NASA Earth Observatory (2010, July) Gulf of Mexico Oil Slick Images: Frequently Asked Questions. NOAA Regional and Mesoscale Meteorology Branch Sun Glint. Accessed September 9, 2014. NOAA Earth Systems Researcher Laboratory (1999, March 3) Glittering Light on Water. Accessed September 9, 2014. Ocean Color Forum (2005, June 8) What is Sun glint and how does it affect ocean color data processing? Accessed September 9, 2014. Ottaviani, M. et al (2013, February 13) Information content of aerosol retrievals in the sunglint region. Geophysical Research Letters. 40 (3), 631-640. Ottaviani, M. et al (2012, June) Polarimetric retrievals of surface and cirrus clouds properties in the region affected by the Deepwater Horizon oil spill. Remote Sensing of the Environment. 121, 389-403. The Physics Classroom Specular vs. Diffuse Reflection. Accessed September 9, 2014.